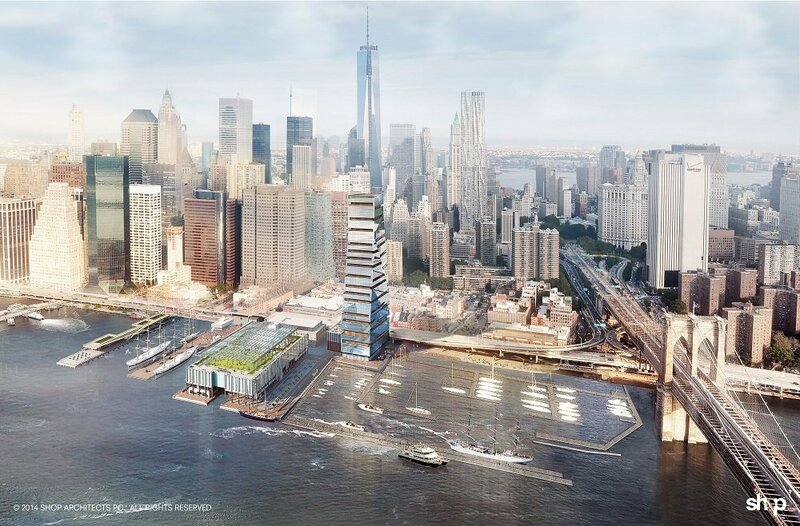 This week, the Howard Hughes Corporation gave a presentation to the South Street Seaport community about their residential tower planned for the waterfront beside Pier 17. 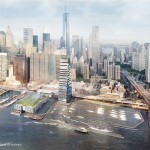 The original design by SHoP Architects was 52 stories and 650 feet, but to satisfy concerns by neighborhood residents and elected officials about the tower’s appropriateness, the firm scaled back the design to 42 stories and agreed to also build a middle school and waterfront esplanade. But even this revised plan was met with much criticism at the community meeting; Manhattan Borough President Gale Brewer and City Council member Margaret Chin both expressed that they would not support the tower and likened it to plopping a high-rise in the middle of Colonial Williamsburg. 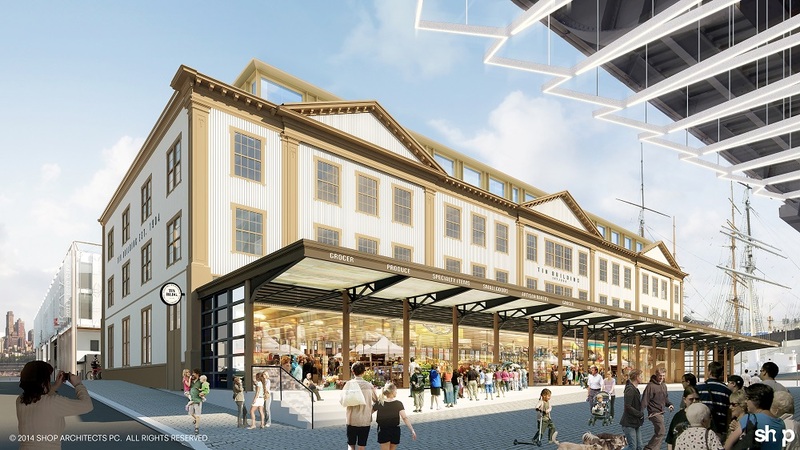 The luxury residential tower is part of Howard Hughes’s overall $305 million plan for the Seaport, which, if approved, would include a restoration of the historic Tin Building and a new home for the Seaport Museum. In addition to being scaled back by ten stories, the revised tower design narrows slightly as it rises to its 494-foot height. But the current zoning for the site allows only a 350-foot tower, so the proposal will need to go through the city’s ULURP (Uniform Land Use Review Procedure) process. It will be constructed out of glass, zinc, and possibly some wood. At the presentation it was noted that the tower’s angles were inspired by sails of the historic ships. Since it’s planned for the waterfront, the base will be raised above the 100-year flood plain with the mechanicals on higher floors. Another point of contention related to the tower is that it will replace the New Market building, which many feel to be a historically significant building. The building used to be home to the Fulton Fish Market, but it’s outside of the historic district boundaries, leaving it vulnerable. The Tin Building, built in 1906, would be moved 30 feet, allowing it to be raised out of the flood plain and creating a plaza in front that would connect with the esplanade. 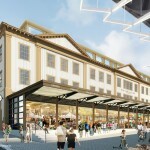 An additional floor would be added and the ground-level would house a food hall. Though SHoP notes that most historic elements of the building were lost in a 1995 fire, they will match the new paint colors to those of 1906. Zig-zagging lights will be added under the FDR drive to accommodate retail pavilions. Though the public and elected officials are divided on the plan, Howard Hughes maintains that the scale of the tower cannot be further reduced, as it will subsidize the infrastructure and other improvements. The project will be presented at the Community Board 1 Landmarks Committee meeting on December 10th and at the Landmarks Preservation Commission on a to-be-determined date in January. Where do you stand on the debate? Let us know in the comments.